Your existing customers are the lifeblood of your business and the revenue that they provide is your most profitable. Why not take advantage of some proven techniques for maximizing this critical revenue stream? 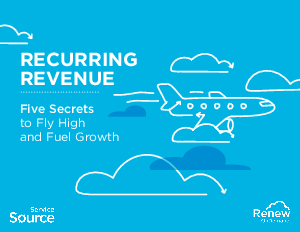 “Recurring Revenue: Five Secrets to Fly High and Fuel Growth” describes best practices honed through 13 years of partnership with some of the leading technology companies in the world. We’re confident that these tips will help you think about your recurring revenue in a different way, and give you a flight plan to start your journey! We wish you blue skies and smooth air!